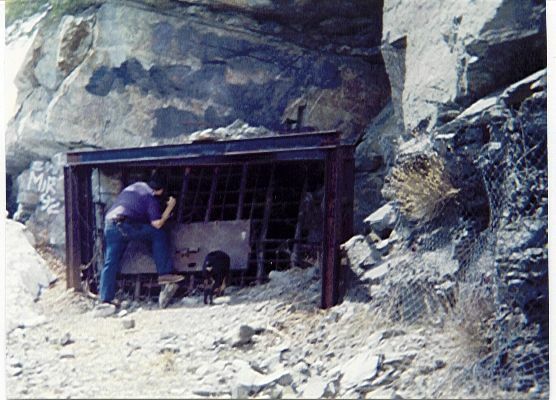 There are several miles of tunnels and shafts in Big Horn mine and about 6 levels. We spent 6 hours in Big Horn Mine and still did not see all the tunnels and levels. This was a very big operation for its time. 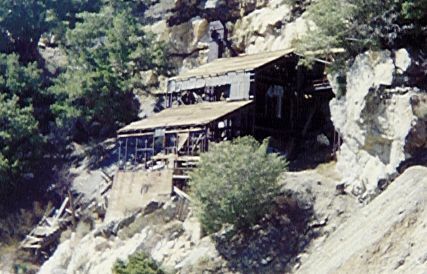 Ruins of the Stamp Mill and Main Entrance To the Mine. There are two entrances: one down to the lower right hand side and one on the upper left of the mill. Entrance to one of the small tunnels of Big Horn, that is blocked for a good reason. There is two feet of water inside, water is dripping and falling all around, and the timbers are all completely destroyed by the water rot. We did find a couple of small spots of gold within a couple of deep holes on the side of the wall in that mine, but we could not get our tools inside the hole (too long and narrow). Copyright © 1999 by Gary Parks and John Rapp. Last update: 5 January 1999.